Man, I thought I’d be able to keep this thing up at least twice a week but life has taken over. Today is the first time I get to sit at my computer to write anything since my last blog post! Lots of things going on in the Panda cage right now: Mardi Gras is Tuesday, the kids haven’t been to any parades yet but my house looks like we’ve thrown a carnival. This past weekend I spent in revelry with adult friends because well, I earned it. How’s that saying go, “Working mother is a redundant phrase”? Yeah, that’s me. So I had a blast, made gumbo for an army of people and went to a parade where I had tons of fun catching beads and throws for my friend’s daughter, Cadence. The panda cubs were with a sitter for the weekend. 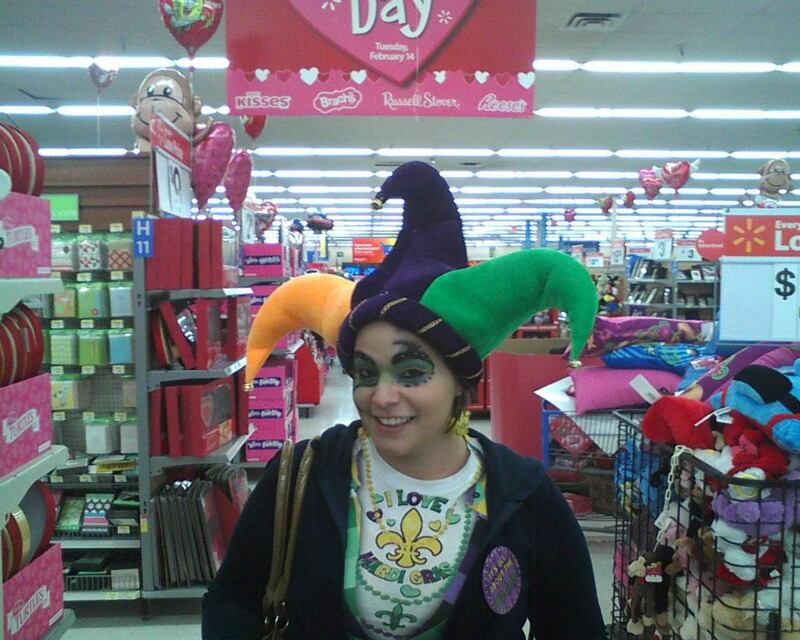 At Wal-Mart, shopping for last minute lawn chairs. Yes, I dress in theme for most holidays. Don't mind the smeared makeup, I fixed it shortly after the picture was taken! For Valentine’s day Maverick and I had more cupcake adventures, which were awesome. 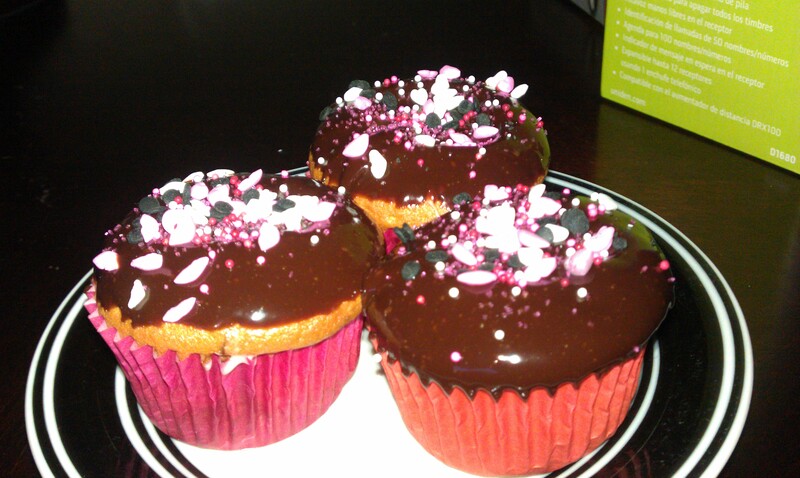 We made “sweetheart cupcakes”. Basically, devil’s food and strawberry cake batter baked in cupcakes. Hollow out the middle, and fill with a blended mixture of cherry preserves, cream cheese, and powdered sugar. Make a ganache, dip the cupcakes in the ganache frosting, and then decorate. They were DELICIOUS. We brought some to my grandfather and other family members on Valentine’s day and then last night I delivered the leftovers to some friends of mine, to prevent me from eating all of them. With the hollowed out middles of the cupcakes (as you know I’m frugal and don’t like to waste ANYTHING) I blended more cream cheese and then dipped in melted semisweet chocolate. VOILA: Cake truffles! 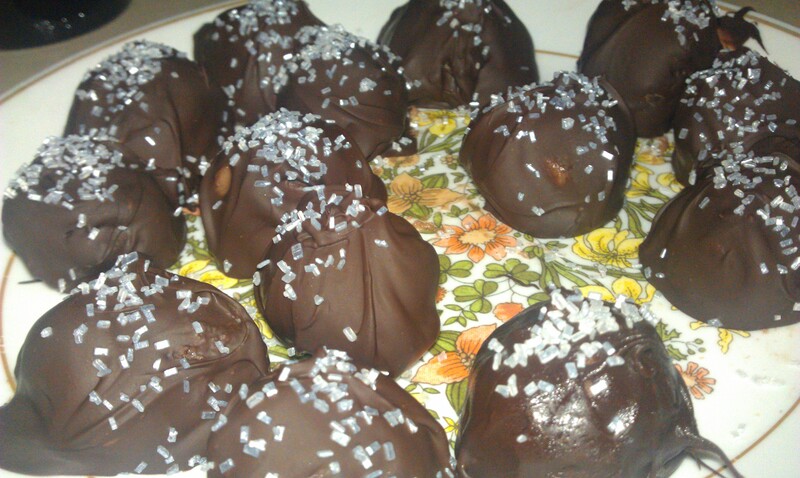 Cake truffles with sugar crystals! 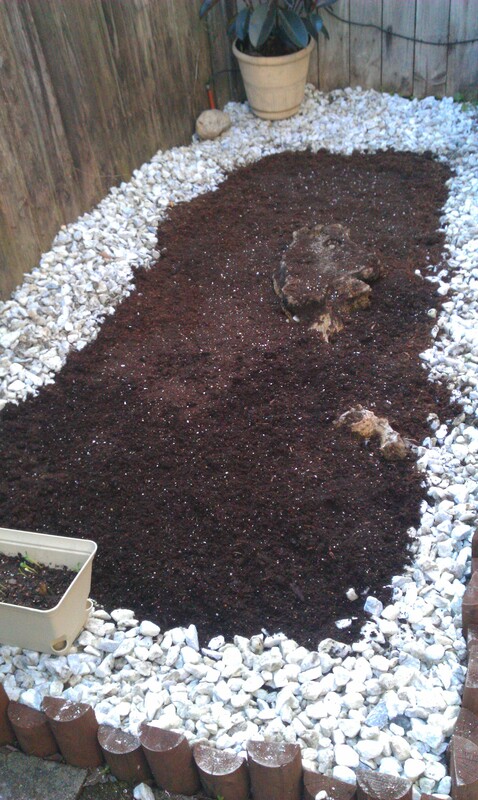 Also last week we turned my rock garden into a raised flower bed for annuals. We have had lots of rain and back and forth between cold and warm weather so I haven’t sowed any seeds yet, but mostly will be planting wildflowers there. Maverick and I can just throw the seeds and wait for the pretty to happen! While digging out the earth for the raised flower bed, Maverick made some new friends. Insects. Worms. Earwigs. All sorts of gross things. It’s always amazing to me how little boys will touch, hold, play with DAMN NEAR ANYTHING and not be bothered by it. We now have a pot of soil and worms outside, and he checks their progress daily. By checking their progress, I mean he pulls them out of the soil and flips them around in his hand a bit then puts them back into the dirt. I’m getting the creeps just thinking about it. 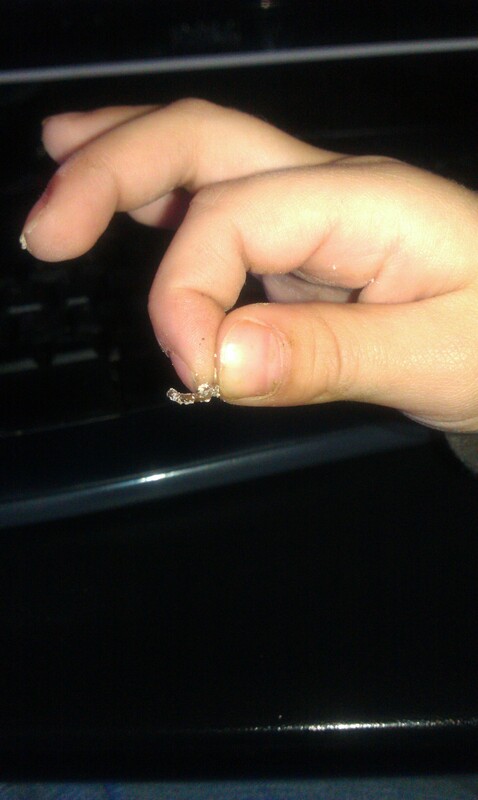 The tiniest worm on earth. His name is "Sam"
On the gardening subject, all of the tomato plants have sprouted true leaves, so that meant last night I had to ELIMINATE THE WEAKER ONES (MWAHAHAHAHA) ok that’s enough of the mad scientist gardner. So now, we have 15 tomato plants in our coldframe. Here they are! In all their glory. Ethan took out the markers so I have no idea which pods contain what varieties but hey, all tomatoes are delicious so I'll be happy if even ONE of these makes it to bearing fruit. 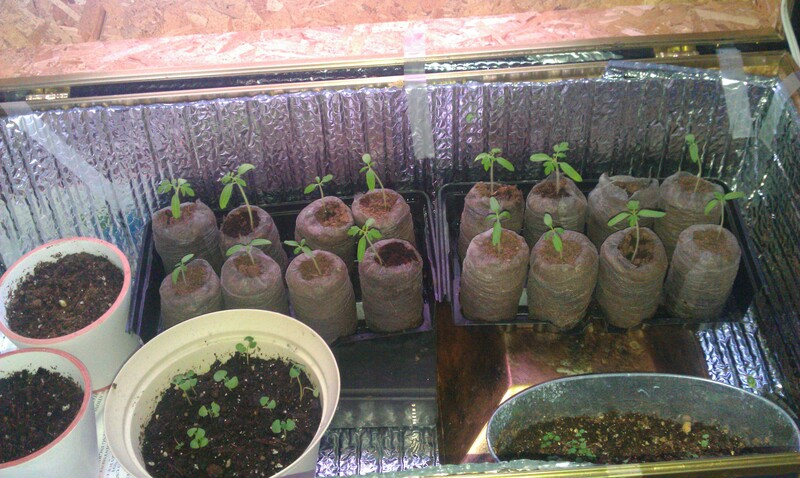 The two pots on the sides are sunflowers, the one in front of the tomatoes is a cluster of basil seedlings that is struggling to survive, and the aluminum pot has some violas. I'm hoping to make a window box with those, it gets too hot here for them to survive the summer outdoors. They are only a couple weeks old at this point. Gardening takes SO MUCH patience. My little artists decided to draw on the sofa today, and I read on google that HAND SANITIZER and PAPERTOWELS would remove ball point ink. And it worked! So for all you moms out there with kids that are as creative as mine, commit that tip to memory. The last time this happened I paid to have the sofa cleaned… this time I just used a lot of elbow grease and remedied the problem myself. I hope that everyone has a blessed week, and I promise that once Mardi Gras settles down I’ll be posting more, it’ll be my Lenten Devotion this year: BLOG MORE OFTEN!